So far this week Asian markets have gained 1.6%, and European markets have gained 1.0%. The SPX started the week at 2875, and gapped up on Monday to reach 2898. On Tuesday it broke SPX 2900, and hit 2917 on Wednesday. All new record highs. The DOW, NYSE and DJ World index all continue to work their way higher as well. The DOW is now about 1.7% from its all-time high. This Int. v uptrend continues unimpeded, and remains in Minute iii of Minor 3. Our short term count from Minute ii SPX 2802 remains unchanged: 2819-2806-2850-2834-2873-2917 (now). 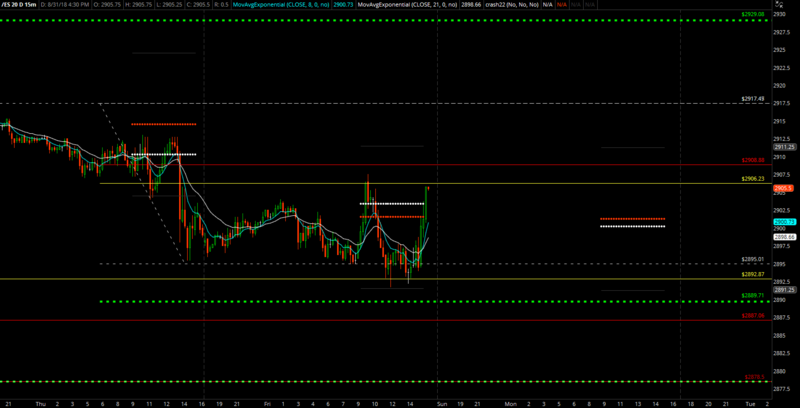 This suggests a small pullback soon, and then a push to new highs before a larger pullback. With a negative divergence of the hourly RSI, that small pullback can come at any time now. Short term support is at the 2884 and 2858 pivots, with resistance at the 2929 pivot. Best to your trading! Tore, are you back from Peru? Do you have a publisher yet? If you scroll back last Weekend Update, you will find a piece of music I posted …Handel’s Ombra mai fu” sung by Maureen Forrester with a suggestion that it was a nice piece of music to reflect on Quantum Physics, Classical Physics and the Soul. Book is still snoozing, need to add a chapter , moderate myself a bit at certain passages. Waiting for the oomp to dive into it…No publisher yet, and back at pond paddeling in Norway. Here is a complete concert, beautifully filmed, and this is for everyone who thought Freddie and Queen just totally wonderful. Only sad things….it was not Wembley, and for Freddie it was the beginning of the end…. Should not be surprising how the U.S. markets will outperform other markets, at this point in time. The guy who ran for POTUS in 2016 promised he would “Make America Great Again“. In other words, he promised that he would do this. Not a political rant. Just a reality check. It’s not surprising, but it’s a problem the wider the divergence gets. And it’s not got that much to do with Trump, that’s a secondary factor. The US stock market isn’t the US economy, and FTSE isn’t the U.K. economy, Dax isn’t the German economy etc. Because you have to consider the regional distribution of revenues, and the currency they’re earned in. It’s true that the US market has a relatively high proportion of earnings earned domestically, but the overseas element is still a lot at 30-40%. And for the European indices, the proportion earned overseas is more like 60-70%, with much of that being dollar denominated as commodities are priced in dollars, some EM countries use hard currency, the dollar being the global reserve currency and of course US exports. So what’s surprising is that the dollar has been mostly rising since April time… and all else being equal, this increases earnings in GBP, EUR, JPY etc. So what you’d expect is that this would be a positive for non US markets. But it hasn’t been, as it’s been more than offset by the liquidity problems caused in EM from having a stronger dollar, plus the reason behind why the dollar has been rising is that growth outside the US is slowing down. So when it comes to making asset allocation decisions, everyone in institutional is going overweight the US vs elsewhere as 1. That’s where the momentum is; 2. That’s where the perceived domestic growth story is and most importantly, 3. The US is the most diversified and liquid equity market in the world. And it’s because of that you’re getting capital chasing US stocks such that momentum is extended. Now clearly this can carry on for a time, but eventually it will mean revert, and the US will underperform elsewhere. So to be bullish on the US what you want to see is some positive momentum build in overseas markets such that the divergence closes but with markets rising. Alternatively, if you don’t get a positive trend going overseas and the US continues alone, I’d say those all time highs are less sustainable. Best returns this decade for SPX (2013 and 2017) have been in good years for foreign markets. All I’m saying is, the more you watch the non US indices, the harder it is to build a case that the selling in them is about to miraculously stop and we start to go higher. They’ve been very choppy but are consistently struggling to make headway and then keep giving way to fresh lows. It’s just not bullish action, and I’m not sure what the narrative is on the horizon that’s going to drive some buying on the fundamentals. You are over thinking the whole thing. Trump is just unofficially ending the Marshall Plan. then all will proclaim …. Enjoy the holiday weekend Gary ! Appreciate the post but fortunately or unfortunately most of us here have access to the same news you post here , some even more I’m sure. I never agreed with NAFTA, and hope Trump either makes U.S. a good deal, or no deal. We can take the heat. TNDM has been my pride and joy all year long. Like lunker, sometimes a blind squirrel finds an acorn. Hey Folks! Long time, no see. This MMFI concerns me. Look how low it is at ATH’s compared to other highs. ANd looks like H&S formed since mid Feb. Happy Labor Day!